Sally Kohn on the TED stage. It's the TED Radio Hour from NPR. I'm Guy Raz. And on the show today, ideas about Why We Hate. So I'm assuming you've been hated. SALLY KOHN: Oh, yes, Guy Raz. I think everyone's been hated. Everyone has been the hater. The question is, who takes responsibility for stopping it? RAZ: This is Sally Kohn. She's a liberal political commentator for CNN. KOHN: Yes, I'm a lefty. RAZ: OK. So by doing that, by putting yourself out there in the world as a left-wing commentator or commentator at all, like, you are going to get haters. It just comes with the territory, right? KOHN: Yeah. I mean, it probably doesn't help that I started my lefty commentating on Fox News. UNIDENTIFIED PERSON #1: OK. You two could not be further apart in terms of your opinions of Obamacare. Sally, you love it. Betsy (ph), you can't stand it. KOHN: You know, that pairing is going to lead to some hating, that probably combined with the whole lesbian thing. Maybe add in the Jewish thing. KOHN: Maybe add in the woman thing, the butch thing. I don't - you know, like, this is really a Choose Your Own Adventure of hate. UNIDENTIFIED PERSON #2: That's what the president did. RAZ: I mean, you have to be kind of a certain type of person, like, really thick skin to do that. Like, I don't think I would ever go out into the world and tell everybody my opinions because I just don't want to deal with that. KOHN: Yeah. I'll be honest with you, Guy. I'm not that person. Getting hate mail, getting hate tweets - I never had that experience before in my life. It did catch me completely off guard, socked me in the stomach. And it wasn't, honestly, that I took it personally, I guess. I mean, it was really - I couldn't believe that our society had produced a culture and a climate in which people would go to the trouble of finding the contact information for strangers in order to treat them so badly and be so cruel. That hurt my sense of humanity. KOHN: So I did what all overly intellectual people do when they have a problem they want to understand, and I wrote a book. 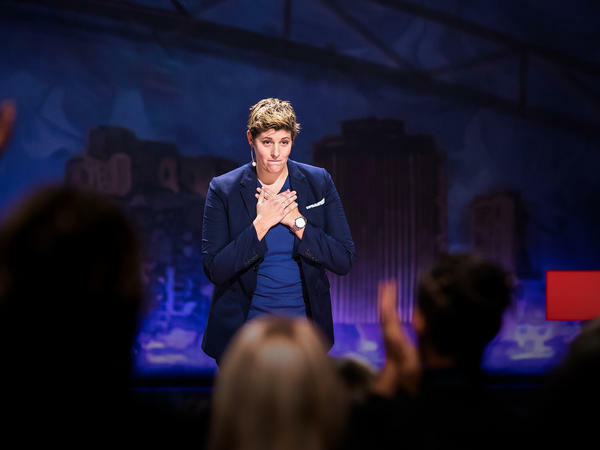 RAZ: Sally Kohn picks up her story from the TED stage. KOHN: I wrote a book about hate. Spoiler alert - I'm against it. KOHN: So in trying to understand and solve hate, I read every book and every research study I could find. But I also went and talked to some former Nazis and some former terrorists and some former genocidal killers because I figured, if they could figure out how to escape hate, surely the rest of us could. Gordon Allport, the psychologist who pioneered the study of hate in the early 1900s, he developed what he called a scale of prejudice. At one end are things like genocide and other bias-motivated violence. But at the other end are things like believing that your in-group is inherently superior to some out-group or, you know, avoiding social interaction with those others. I am defining hate in a broad way because I think we have a big problem. And we need to solve all of it, not just the most extreme. RAZ: What did you learn about the human impulse to hate, like, in sort of writing this book? Do you think we're wired to hate? KOHN: So that's a great question. I was desperate to find evidence that we're not wired to hate. And it turns out, we are to an extent. All right. I mean, that's like you and I, way back when in our loincloths, we were sitting in the valley banging our rocks together. And, you know, some strange people we didn't know in their loincloths came up over the hill, and we were afraid of them. And that, over thousands of years, turns into wiring in our brains that makes us fear the other. But what's useful here - a metaphor someone uses in the book is the difference between hardware and software. So that's the hardware that we all have. But who we hate is the software. That's been encoded into our brains by society and culture and politics. There's not some part of our DNA that makes us racist. And there's not some synapse that makes us hate Republicans or hate Democrats. That's the software. That's the programming. It's what we've all learned. And that means we can unlearn it. KOHN: People tell me I'm a nice person to the point where it's part of my personal and professional identity that I'm so nice and able to get along with anyone, even my most fierce opponents. But what no one knows is that I was a bully. When I was 10 years old, there was a girl in my class at school named Vicki (ph), and I tormented her mercilessly. Vicki was clearly a troubled kid. She would hit herself and give herself bloody noses, and she had hygiene problems. But instead of helping this girl who was plainly suffering from hardships in her life, we called her sticky Vicki. I called her sticky Vicki. RAZ: So Sally, full disclosure - I know you a little bit, and I know that you are an extremely kind person. RAZ: So I know this story isn't who you are. And, I mean, you were a kid, right? And lots of kids do mean things. But I guess this thing you did to Vicki, it's always been in the back of your mind. KOHN: Yeah. It was, it was in my mind, but sort of pushed to the edges. KOHN: And it was when I was at Fox and really started getting hate mail and sort of had these - like, who - what kind of person would pick on someone for no good reason? And it was as though the edges of my mind sort of knocked on my conscience and said, oh, hey, wait; you - you're that kind of person; you've done it, too. And it started to haunt me more and more that I thought of myself as a good person. KOHN: And, you know, the reality is, good people do horrible things. KOHN: Especially kids, but especially adults, too. You know, one of the things that struck me in the book the most was when a philosopher said to me, you know, we don't have mass atrocities in the world because of a handful of psychopaths. There aren't enough psychopaths in Rwanda or Germany or Serbia. We have mass atrocities because masses of people participate in them. And we tend to think those are different people than us, than the good people. And part of it is breaking down this idea that there are good people and bad people. There are people. And we can do good things, and we can do bad things. And the problem is, right now, we have too many excuses, even in small, petty ways that seemingly, you know, aren't that bad, but add up to a culture and a climate that is cruel and allows greater inhumanities and injustices to fester. And we don't see ourselves as complicit in that. RAZ: What do you think the opposite of hate is? KOHN: I don't think it's love - not in the sense that we tend to understand that, anyway, because you don't actually have to love someone to not hate them. You don't even have to like them. What I think we have to understand is, in spite of our differences and our disagreements, we share a common humanity. And recognizing that connection, promoting policies and institutional changes and structures that respect that connection and treat people equally is the opposite of hate. KOHN: Let me give you just one example in the West Bank. When Bassam Aramin was 16 years old, he tried to blow up an Israeli military convoy with a grenade. He failed, fortunately, but he was still sentenced to seven years in prison. When he was in prison, they showed a film about the Holocaust. Now, up until that point, Bassam had thought the Holocaust was mostly a myth. But when he saw what really happened, he broke down crying. And eventually, after prison, Bassam went on to get a master's degree in Holocaust studies, and he founded an organization where former Palestinian combatants and Israeli combatants come together, try to find common ground. By his own account, Bassam used to hate Israelis. But through knowing Israelis, and learning their stories and working together for peace, he overcame his hate. And Bassam says he still doesn't hate Israelis, even after the Israeli military shot and killed his 12-year-old daughter, Abir, while she was walking to school. Bassam even forgave the soldier who killed his daughter. RAZ: You know, I'm going to say something that might upset people listening and maybe even you, Sally, which is, I was really moved by the story of Bassam, but I also - I've had a hard time identifying with it. I mean, his child was killed, and he forgave the soldier who killed his daughter and sort of flushed hatred out of his system, which is remarkable and, of course, laudable. But what does that get Bassam? KOHN: I mean, I have the same struggle, I think, you do. I don't think I could do that. KOHN: In an even more tangible way, I had the experience of being in Rwanda, sitting with a woman who - a Tutsi woman who had invited into her home her neighbor, a man she calls her friend, who had murdered her husband and children. And to watch her talk with him, laugh with him, welcome him in her home, serve him tea - I don't know that I'm capable of that. There is also a part of it that feels unjust, that - it feels it's asking too much of those from whom so much has been taken, those who've been oppressed and victimized. What I walk away with is, we as people are capable not only of brutality and cruelty and injustice, but also compassion and kindness and forgiveness. That, to me, is remarkable and endlessly hopeful. KOHN: The entire time I was traveling around the Middle East and Rwanda and across the United States, hearing these unbelievable stories of people in communities who had left entire histories of hate behind, I was still looking for Vicki. It was so hard to find her, in fact, that I hired a private investigator, and he found her. her. A year after I began my journey, I wrote Vicki an apology. And a few months later, she wrote back. I'm not going to lie, I wanted to be forgiven - I wasn't. She offered me sort of conditional forgiveness. What she wrote was - messages such as yours cannot absolve you of your past actions. The only way to do that is to improve the world, prevent others from behaving in similar ways and foster compassion. And Vicki's right, which is why I am here. Thank you. RAZ: Sally Kohn. She's a political commentator for CNN and author of the book "The Opposite Of Hate: Field Guide To Repairing Our Humanity." You can see Sally's full talk at ted.com. [POST-BROADCAST CORRECTION: In Sally Kohn's TED talk, she says that Bassam Aramin's daughter was 12 years old when she was killed walking to school. Bassam's daughter was actually 10 years old when she was killed walking from school.] Transcript provided by NPR, Copyright NPR.